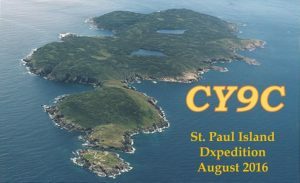 So, in a little under 4 months, I’ll be on St. Paul Island – a little island just north of Cape Breton. I’ll be part of a team of operators activating the island for a DXPedition. We’ve secured our insurance, our permit and our callsign: CY9C. We will be operating from 2 different sites on the island, approximately 3km from each other, with 2 80m high hills in between us. Amongst my responsibilities is the building of a network to link the two sites together, and link that network to the Internet to allow for live logging of all contacts to ClubLog. Sound interesting? 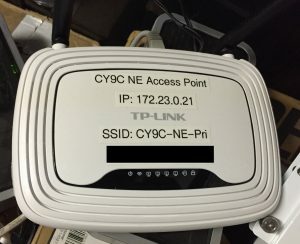 I build and maintain corporate networks for a living, but I’m also dabbling into Amateur Radio-based Mesh Networking (i.e. : BBHN, AREDN), so I thought I’d take some time and write about what I’ve designed and built, and how we plan to operate from the island in August. First, I needed to get Internet access on an uninhabited island in the middle of the ocean (without spending thousands of dollars on a satellite feed). That was the easy part… kinda. Bell Mobility recently spent a lot of money upgrading cellular access on Cape Breton Island. There are 2 850MHz cellular repeater sites on the northern coast that I can access from St. Paul Island, but I wanted to be sure. So, I purchased a U70 Uniden Cellular Booster Kit – a 70dB cellular repeater, 11dB pre-amp, 14dBi 850MHz beam, and low-loss coax. I’ll set it up to point to Nellis Harbour and that should give us solid 3G cellular access, and therefore Internet, on the island. So how to you create a wireless data link between 2 sites separated by extreme terrain? Well you certainly don’t use microwave – there’s no way to get a 2.4GHz, 3.45GHz or 5.8GHz signal through solid granite. Even 900MHz would be iffy. 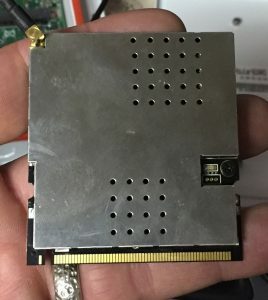 So I found a firm in Ottawa, Ontario called Xagyl Communications that makes a Mini-PCI module that brings standard WiFi to the 70cm UHF band! 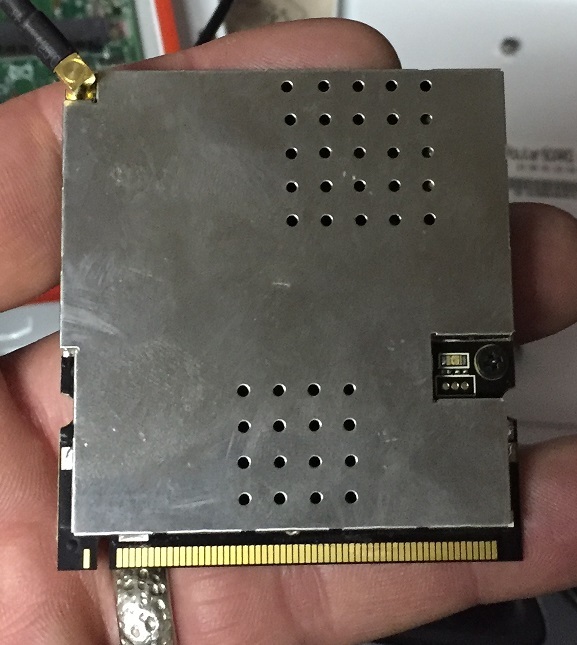 I bought 2 of these, and have installed them on 2 Mikrotik RB411 Router Boards in outdoor, mast-mountable enclosures. For antennas, I’ve chosen the Cushcraft A449-6S UHF Beam. 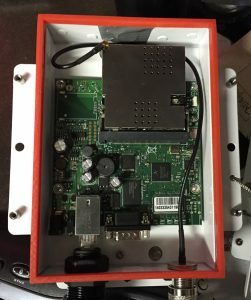 I’ve replaced Mikrotik’s RouterOS in favour of OpenWRT – an open source Linux-based distribution for embedded devices. I’ve configured the units as a WiFi bridge to link Atlantic Cove to the North-East Point. I have nothing even close to line-of-sight between these locations, so I’ll be relying on Diffraction, also known as the Knife-Edge Effect, to establish the link. 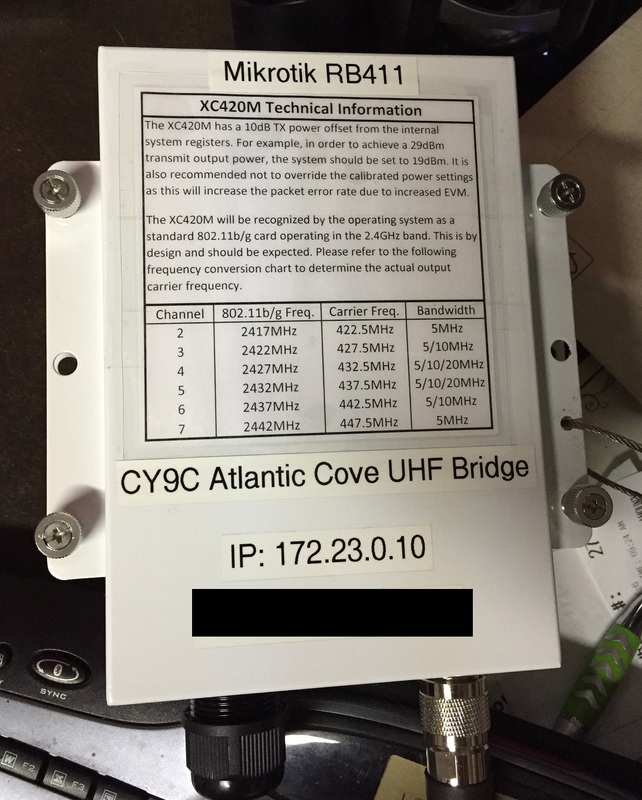 The Xagyl UHF modules put out 29dBm (1W) of power, and the Cushcraft antennas are 10.2dBi, so assuming approx. 1dB of various losses (connectors, cable, etc…), I should have approx. 9W of effective radiated power – enough to get where I need to go. With the sites bridged, we just need to put the last network elements in place. 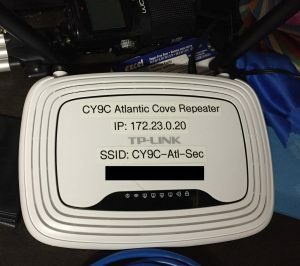 I have a Netgear MBR1516 Cellular Router (also called a “Turbo Hub”) that will be used to get cellular Internet and act as our router and the primary wireless access point in Atlantic Cove. 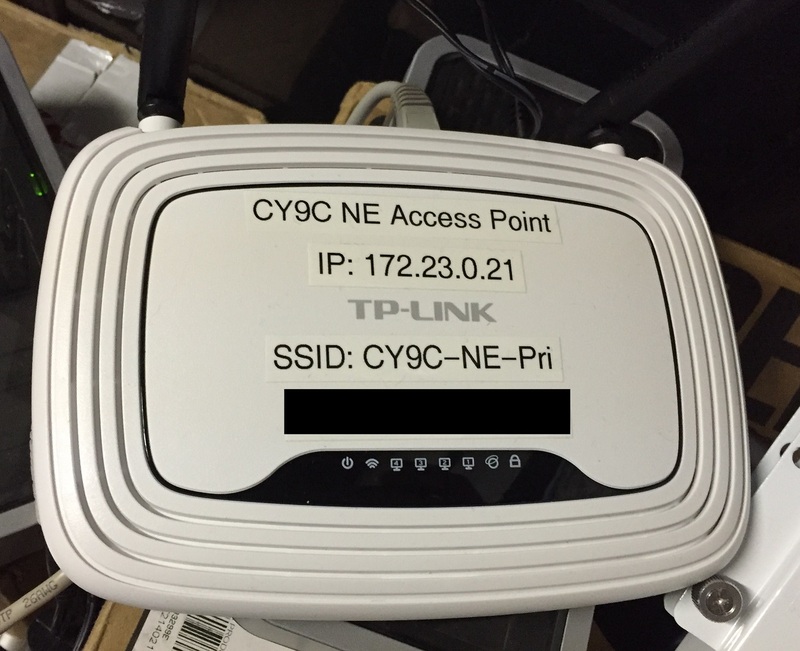 Along with the Netgear, I’ve purchased 2 TP-Link TL-WR841N routers and changed the on-board operating system to OpenWRT. 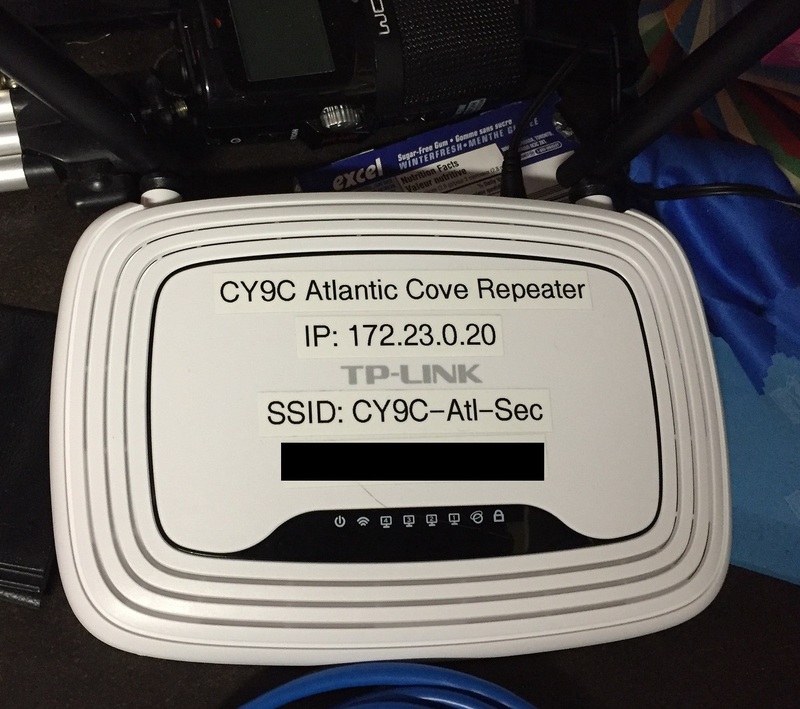 One of them has been setup as a repeater for the network in Atlantic Cove, and the other as the primary wireless access point for the North East Point site. We will be using N1MM+ to log the entire DXpedition. Additionally, since we’ll have live and relatively inexpensive Internet access, we’ll be using N2AMG’s N1MM+ ClubLog Gateway plugin to push all contacts to ClubLog in realtime, thus allowing all those who make contact with CY9C to check to ensure they made the roll – no waiting for updates 🙂 Since we’ll have 8 (or more) stations going, and several of us separated by terrain, we can use N1MM+ to track who is on what band using what mode at a glance. I’ve built the entire network on my workbench, and at this point, it’s completely plug’n’play. 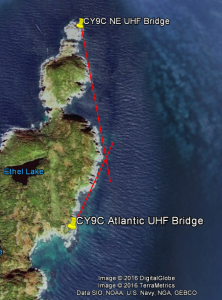 I’m going to do some distance testing with the UHF bridge, but for now, we just wait until we land on the island to set it up and see how it performs. 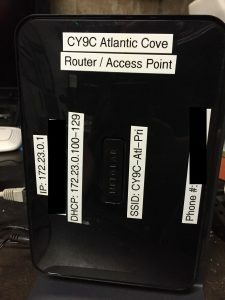 Did you know there is an ISP on North Cape that has a footprint on St. Paul?